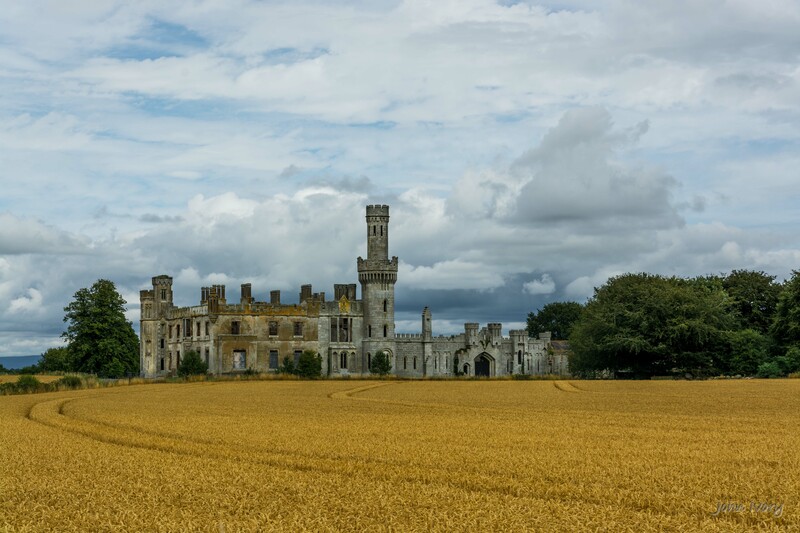 A slightly unusual post this time, in that there is only one subject in these photos – Duckett’s Grove in County Carlow. To make matters worse, the photos are all taken pretty much from the same angle and perspective. However, to make it more interesting, I have used photos of Duckett’s Grove taken yesterday, July 5th 2014 and also from 2013, taken in August of that year. The striking difference is the rotation of the crop in the foreground field. Last year’s wheat crop has given way to this year’s rapeseed. 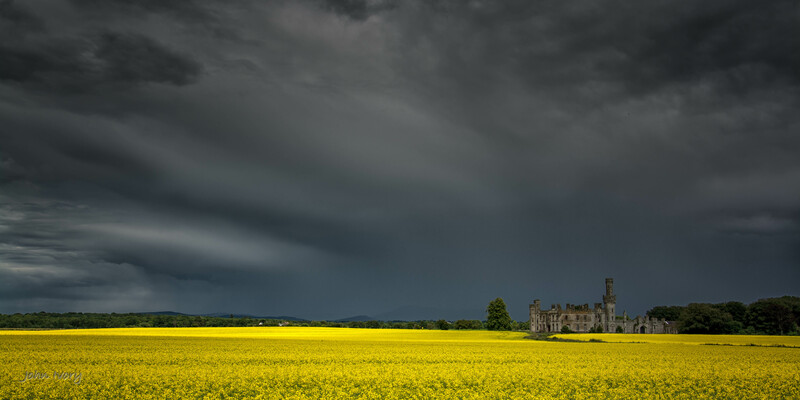 In addition, as someone who likes an interesting sky in my landscape shots, I was not disappointed on either occasion, though yesterday’s showers helped provide a darker and more brooding atmosphere. 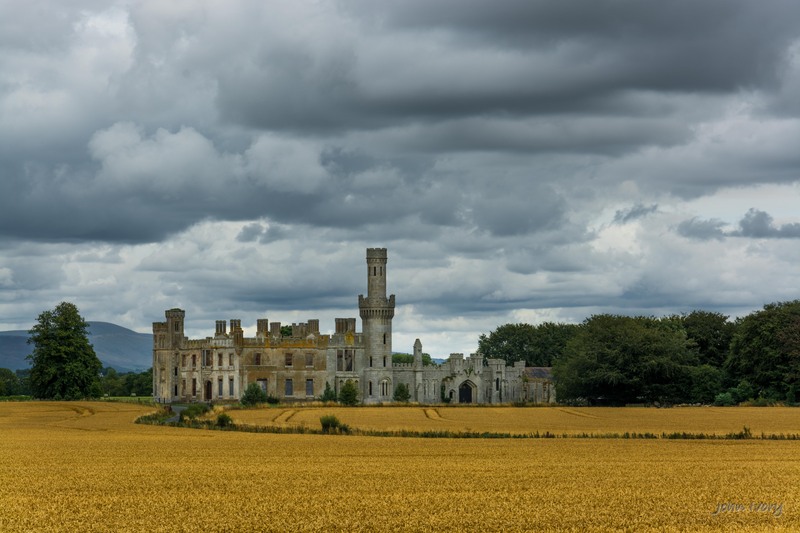 Duckett’s Grove itself was built in 1830 by William Duckett in an estate covering more than 5,000 acres of the Carlow countryside. It was designed in a Castellated Gothic revival style by Thomas A. Cobden for John Davidson Duckett around 1825. The building incorporates numerous towers and turrets of varying shapes – round, square and octagonal. One tall octagonal turret rises from the structure. Duckett’s Grove is elaborately ornamented with oriels and niches containing statues. The house itself is situated in the townland of Rainstown, between Carlow and Tullow. Following the departure of the Ducketts the estate was managed by an agent until 1921, then by local farmers and later by the Land Commission. The division of the lands was completed by 1930. Duckett’s Grove was destroyed by fire in April 1933. 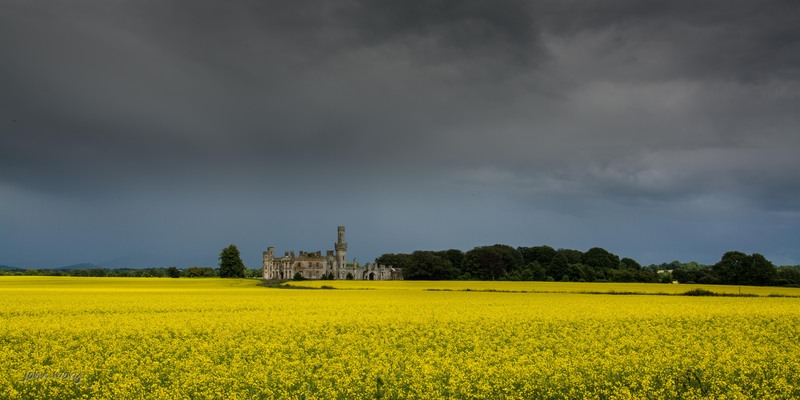 In September 2005, Carlow county council acquired Duckett’s Grove and commenced with the restoration of two inter-connecting walled gardens. It was officially opened in September 2007 for use as a public park. The photos below are in random order. 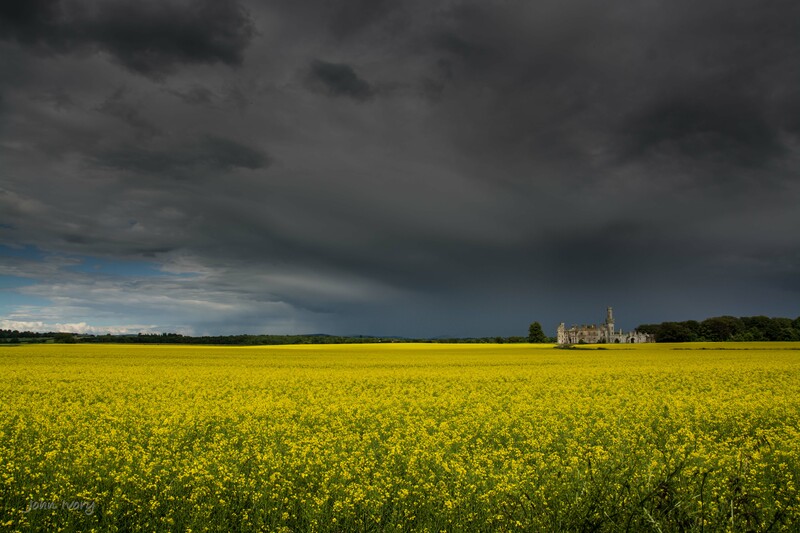 Yellow rapeseed foreground = July 2014, golden wheat foreground = August 2013. Wonderful set of images John – great location and dramatic light. 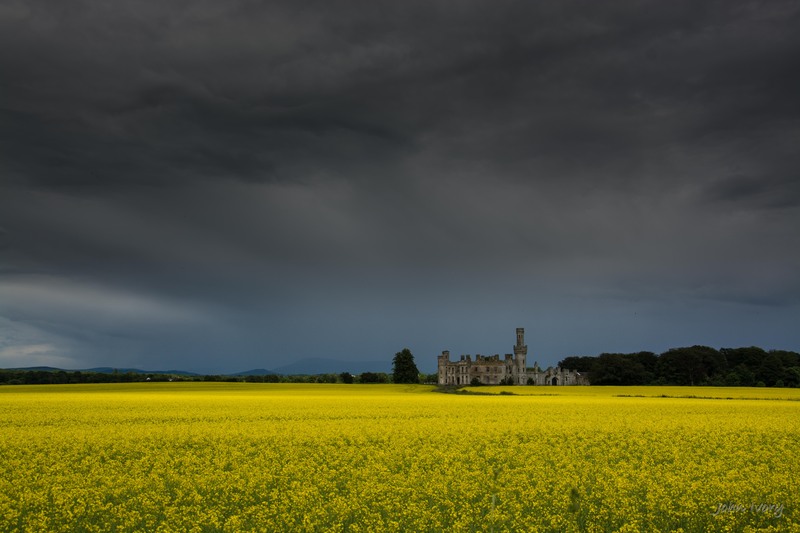 Love the simplicity and stark contrast of the three elements – crop, building and sky. And a shout out to Carlow CC for making the restoration their business. Thanks Roy. I have been lucky on each visit to have different but equally interesting elements to capture. wow, beautiful shots, will have to bring my grandson to see the place now! Hi John, These are incredibly dramatic and colorful. Love the subject, light and composition. Thank you, Jane. It certainly pays to re-visit locations to avail of different weather / lighting conditions!